The 3 in 1 Dog Shampoo Goat Milk Soap is specifically made for packing a triple punch at your pet's all around hair/fur health. The dark color of this natural soap is from the pine tar, known for helping to soothe a pet's skin, ward off unwanted critters that might be hitching a ride on your beloved canine, and for keeping their coat in tip top condition. 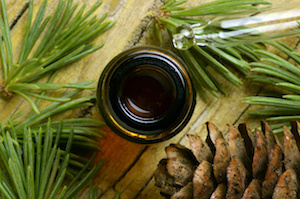 The pungent scent of the pine tar can be a little strong (it quickly fades after washing), BUT it is antiseptic, bactericidal, insecticidal, and naturally deodorizing. Our customers have raved about how they have been using our regular goats milk soap for years on their pets. 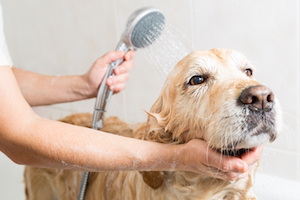 They have shared that, after even one Healthy Pet bath treatment they would find both fleas and ticks loosened from the coat of their dog, and washed safely down the drain. Pair that great pest killing treatment with the healing benefits of the organic and natural oils of our soaps, plus the moisturizing properties of raw goats milk, and this 3 in 1 Dog Shampoo will revitalize your pet's coat bringing back that luster they once had as a pup. Did you know that a female flea can live anywhere from 2 to 3 months, and during that time can lay as many as 2000 eggs a day? Yep, thats why when your dog gets fleas they can be all over the house in no time. One outing for a walk at the park or even in your backyard can mean you're inundated with a pest that can make life completely miserable for not only you but your furry companion as well. That's why a healthy goats milk bath weekly is YOUR best friend when it comes to fighting off those horrid creatures. Our goats milk dog and pet shampoo soaps are specially formulated with just the right ingredients combination that will help you fight off those little buggers. This 3 in 1 Dog Shampoo Goat Milk Soap bar is designed specifically for dogs (not to be used on cats!) and the scent will invigorate both you and your best friend as soon as you start the bathing process. As our soaps are made with therapeutic plant based ingredients, the natural healing attributes of the goats milk soap will soak in to the skin and leave your dog with a refreshed, balanced skin complexion. Unlike the harsh chemically laden stuff they have the nerve to call soap sold in big box stores. So, give your dog a fighting chance against the natural outdoor world they explore every day. Let them roam and play in freedom, without worry or care of what they will be bringing into the house for your family to be exposed to, knowing you are armed and ready to face whatever comes.